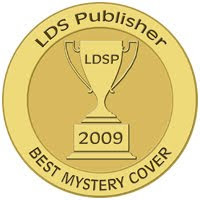 It’s time to announce the overall winner of the 2009 Best Cover Award for books by LDS authors. But first, a little commentary and explanation. I designed some awards. Yes, I did! It took me most of one day over the holidays, so I hope the winners will display them on their blogs or websites with pride. This is a lovely silver medal that lists the year and the genre the cover was placed in. After that, the awards break into two categories: Readers Choice (as voted on by you) and Publisher’s Choice (as voted on by me). 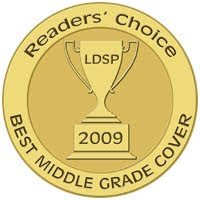 Each genre will have two Best Genre Cover awards. One will be the Readers’ Choice Best Genre Cover, like the lovely award to the right. This award is for the winners from the VIZU polls. It is gold, because it’s a gold winner, and it clearly says Readers’ Choice at the top. The other is the Publisher’s Choice Best Genre Cover. 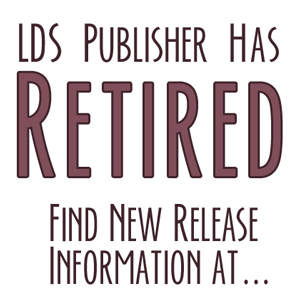 It is also gold, but has LDS Publisher at the top — because LDS Publisher (me) picked these winners. Not that my taste is superior to that of the reader, but I love the covers that I love and want them to get something special, too. In some genres, the same book won both of these awards. Last, there is THE overall winner, Best Book Cover of 2009, where the winners of each genre category went head-to-head. 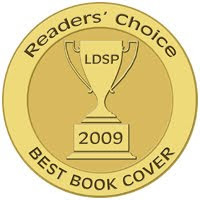 Again, there are the two categories—Readers’ Choice and Publisher’s Choice. 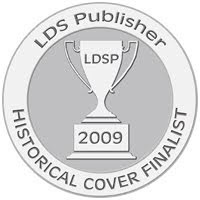 Once again they are gold and they have either Reader’s Choice (picked by you) or LDS Publisher (picked by me) at the top of the award. The bottom of the award, of course, says BEST COVER. I will be sending out emails to the authors, probably later today and will attach the awards for them. If you’re a winner and don’t get your award by Tuesday, it means I don’t have your email address and you’ll need to send it to me. Also, one last note. I have posted my thoughts about each book cover in the comments of the Genre Finalists posts, so you can read why I picked the ones I did, as well as why the readers picked the ones they did. Those medals seem like awesome awards. All the covers had some good and bad to them. The stories in the books are probably be really amazing.